I feel as though I am wearing many layers in my grief. An infinite amount of layers. I stand alone and naked, lifeless in my being, trying to tear the layers from my body. I grow frustrated as I find the layers are endless. I don’t want to feel. Leave me alone. They grasp harder as I continue my attempts to peel them away. Their fibers wind deeper into my skin, my soul. I pull harder, screaming, clawing at myself, at the layers. I fall to the ground, winded, and defeated. I am feeling emotionally exhausted lately. The exhaustion even has an effect on my memory. I have read of “widow/widower’s fog” and I assume that is what I am experiencing. It’s not only a mental exhaustion, but perhaps a spiritual exhaustion too. I’m not where I want to be, but I don’t know where I want to go and where I want to be is no longer possible. It is no longer in existence. I’m still angry he had to leave me. I may be accepting God’s will, but that doesn’t mean I am not angry about it. I miss our life together. I was not only ripped from the one I love, but ripped from our life too. Our things are hiding in boxes and I miss seeing his mess in his office. His mind worked so quickly that he left a trail of thoughts and work in things all over his space. I miss that. I miss him walking into the room in his Dickies and flannel shirt with a green beanie on his head. He was my mountain man. I miss seeing him in nature, in which he thrived, tying up a hammock or pitching a homemade tent. He brought me back to the natural world which had longed for my presence for many years. 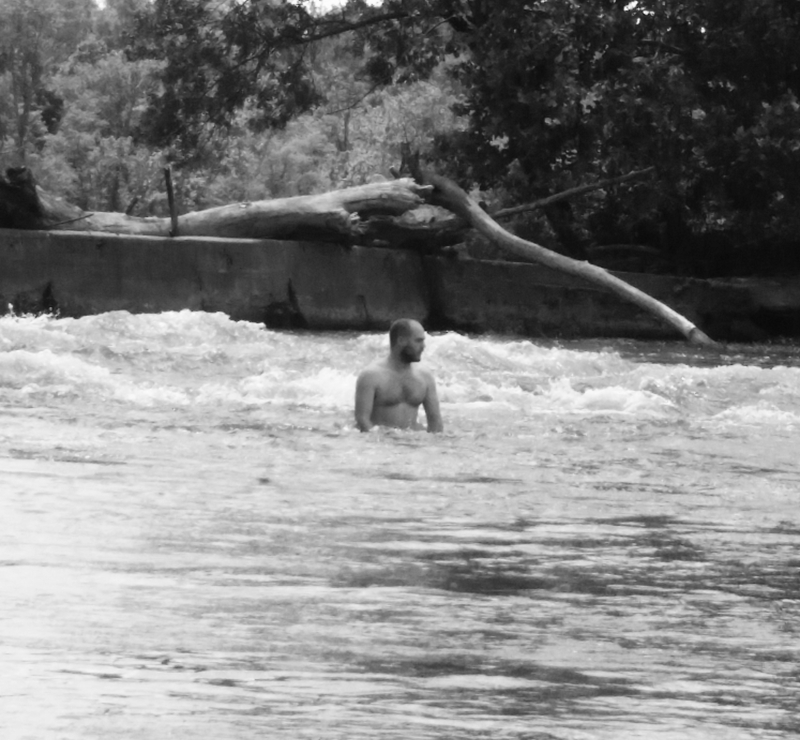 He loved the river and would take me there to explore and swim. I would watch him, king of the river, dive and float. He would go under and disappear, giving me a near heart attack, and then re-emerge smiling like he knew. He was playful. He knew how to get my goat too, but I loved it. He was also very logical and analytical. He didn’t accept nonsense when he was passionate about something. He stood by his research. I remember waking up at 4 in the morning and realizing he still wasn’t in bed. I would walk to his office in my haze and see him sitting behind his screen, soaking in whatever knowledge he quested to find that night. He would almost require a white paper for any argument. I needed to do my research before I fought for my case. He made me think more. I feel my opinions, I don’t often think them. He helped me explore subjects on a deeper level, seeking the truth. I miss the moments he would take to come up behind me and wrap his arms around me. He would often tell me that I was beautiful. “You’re so beautiful, love.” I would roll my eyes, smile, and give him a kiss. He is the only person who helped me believe I could be beautiful. Yesterday, it snowed. I hate snow. I hate the cold and the work required to deal with the snow. Chris loved snow though. He would teach me, enthusiastically, how to outfit myself properly so I didn’t feel the cold. It worked. Perhaps the snow wasn’t so bad when he was with me. I somewhat enjoyed it with him. We could spend days, just he and I, trapped in our apartment as snow fell heavily outside our window. It wasn’t so boring with him and he made the experience joyful. We would play, build forts, hold each other, and cook together. I just laid in bed yesterday, holding on to our snow day memories. I hope he enjoyed watching the pups frolicking in the yard. I hope he was with us. I even smiled a bit, giggled a bit, watching them leap and tackle each other in the snow. Blaze likes to eat the snow and then he emerges with a white beard like an old man. And I know Chris would have loved to see Yuki in the snow. He didn’t get the chance to before he passed. He would have thoroughly enjoyed seeing her in her element. She looked so beautiful. I carry so many layers and it hurts. As I writhe on the ground, they sink in even deeper. I fight, but to no avail. I slowly begin to accept their presence. And as they reach for every crevice of my internal being, I grow heavier. But with the weight, I don’t float away.